Be the first to share your favorite memory, photo or story of Clara Bell. This memorial page is dedicated for family, friends and future generations to celebrate the life of their loved one. 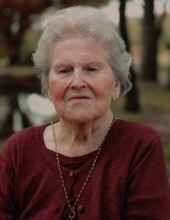 Clara Bell Martin – Knust, age 94 of Breckenridge, reached out and took the hand of her precious Lord’s hand in her daughters residence in Wichita Falls, on April 10, 2019. Funeral services will be held at 2 p.m., Sunday, April 14, 2019 at the Melton-Kitchens Chapel with Rex Boggs and Dr. Calvin Easterling officiating. Visitation will be held from 6 p.m. to 7 p.m. at the Melton-Kitchens Chapel on Saturday, April 13, 2019. The service will be under the direction of Melton-Kitchens Funeral Home. Clara Bell was born November 9, 1924 in Weatherford, Texas to Albert Franklin and Mattie Darleen in their farm house in Parker County. She attended schools in Breckenridge and lived there 91 years. She was a member of the Gunsight Baptist Church. She was married to George Samuel Martin, Jr. for fifty years, after his passing Clara married Loy Knust. Together they raised five children. She loved her family, friends and Breckenridge very much. She was a lifelong member and acted as chaplain of the Ladies Auxiliary of the Veterans of Foreign Wars. Her wisest words were, “Everyone should be kind to one another since they, themselves, might need a ride in the rain someday.” She was preceded in death by her parents, husbands; George Martin, Jr., Loy Knust, son, Ronnie Martin and grandson, Major Troy Gilbert. Clara Bell is survived by daughter, Kaye Gilbert and husband, Ronnie of Wichita Falls, sons; Jimmy Martin and wife, Linda of Breckenridge, Donnie Martin and wife, Noi of Mansfield and Steve Martin and wife, Pam of Breckenridge, seven grandchildren, fifteen great grandchildren and four great great grandchildren. "Email Address" would like to share the life celebration of Clara Bell Martin Knust. Click on the "link" to go to share a favorite memory or leave a condolence message for the family.